Guanabana – The delicious, healthy, weird looking fruit. 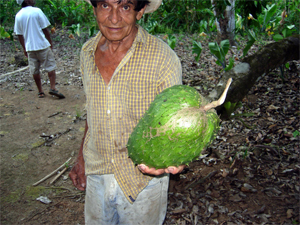 Jose Angel of the Fruit Farm Tour holding a Guanabana fruit. The Guanabana fruit (pronounced gwa-na-ba-na) was one of those interesting tropical fruits we had never seen before we came to Costa Rica. The fruit gets to be the size of a football and is best prepared as a drink that tastes amazing. The tree, leaves, fruit and seeds all have medicinal properties as well. Please enjoy our informative article about this curious looking fruit. Guanabana or Soursop is a broad leaf flowering evergreen tree called the Graviola tree (Annona muricata) native to the Caribbean, Central and South America, from Brazil north to the West Indies. It is in the same genus as the cherimoya and the same family as the pawpaw. The Soursop is adapted to areas of high humidity and relatively warm winters; temperatures below 5 °C will cause damage to leaves and small branches, and temperatures below 3 °C can be fatal. The Guanabana fruit grows right off the side of the tree. Comparisons of its flavor range from strawberry and pineapple mixed together to sour citrus flavor notes contrasting with an underlying creamy roundness of flavor reminiscent of coconut or banana. The fruit is somewhat difficult to eat, as the white interior pulp is studded with many large seeds, and pockets of soft flesh are bounded by fibrous membranes. 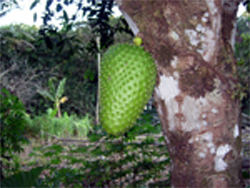 The soursop is therefore usually juiced rather than eaten directly. The sweet pulp is used to make juice as well as candies, sorbets and ice cream flavorings. Guanabana also has some medicinal properties. Every region uses it differently. It’s: antibacterial, antiparasitic, antispasmodic, astringent, hypotensive, insecticide, sedative, and cytotoxic. Below are a series of pictures explaining the process of preparing the guanabana fruit into a drink. The Guanabana is sliced in half and the pockets of soft flesh are pulled from the fruit by hand. The juice is squeezed from the fruit through a strainer. Then the juice is squeezed from the fruit just the fibrous membrane and seeds are left. There is also information that extracts from the Graviola tree are effective in combating certain types of cancer. Although the information I found on the web cannot be substantiated it makes for an interesting read. Research shows that with extracts from this miraculous tree it now may be possible to: attack cancer safely and effectively with an all-natural therapy that does not cause extreme nausea, weight loss and hair loss; protect your immune system and avoid deadly infections; feel stronger and healthier throughout the course of the treatment; boost your energy and improve your outlook on life. The source of this information is just as stunning: it comes from one of America’s largest drug manufacturers; the fruit of over 20 laboratory tests conducted since the 1970’s! What those tests revealed was nothing short of mind numbing. Extracts from the tree were shown to: effectively target and kill malignant cells in twelve types of cancer including colon, breast, prostate, lung and pancreatic cancer. The tree compounds proved to be up to 10,000 times stronger in slowing the growth of cancer cells than Adriamycin, a commonly used chemotherapeutic drug. What’s more, unlike chemotherapy, the compound extracted from the Graviola tree selectively hunts down and kills only cancer cells. It does not harm healthy cells! One of America’s biggest billion-dollar drug makers began a search for a cancer cure and their research centered on Graviola, a legendary healing tree from the Amazon Rainforest. Various parts of the Graviola tree including the bark, leaves, roots, fruit and fruit-seeds have been used for centuries by medicine men and native Indians in South America to treat heart disease, asthma, liver problems and arthritis. Going on very little documented scientific evidence, the company poured money and resources into testing the tree’s anti-cancerous properties and were shocked by the results. Graviola proved itself to be a cancer-killing dynamo. But that’s where the Graviola story nearly ended. The company had one huge problem with the Graviola tree: it’s completely natural, and so under federal law, not patentable. There’s no way to make serious profits from it. It turns out the drug company invested nearly seven years trying to synthesize two of the Graviola tree’s most powerful anti-cancer ingredients. If they could isolate and produce man-made clones of what makes the Graviola so potent, they’d be able to patent it and make their money back. Alas, they hit a brick wall. The original simply could not be replicated. There was no way the company could protect its profits or even make back the millions it poured into research. As the dream of huge profits evaporated, their testing on Graviola came to a screeching halt. Even worse, the company shelved the entire project and chose not to publish the findings of its research! Luckily, however, there was one scientist from the Graviola research team whose conscience wouldn’t let him see such atrocity committed. Risking his career, he contacted a company that’s dedicated to harvesting medical plants from the Amazon Rainforest and blew the whistle. Evidence of the astounding effectiveness of Graviola and its shocking cover-up came in fast and furious…The National Cancer Institute performed the first scientific research in 1976. The results showed that Graviola’s “leaves and stems were found effective in attacking and destroying malignant cells.” Inexplicably, the results were published in an internal report and never released to the public. Since 1976, Graviola has proven to be an immensely potent cancer killer in twenty independent laboratory tests, yet no double-blind clinical trials – the typical benchmark mainstream doctors and journals use to judge a treatment’s value – were ever initiated. The most significant part of the Catholic University of South Korea report is that Graviola was shown to selectively target the cancer cells, leaving healthy cells untouched. Unlike chemotherapy, which indiscriminately targets all actively reproducing cells (such as stomach and hair cells), causing the often-devastating side effects of nausea and hair loss in cancer patients. A study at Purdue University recently found that leaves from the Graviola tree killed cancer cells among six human cell lines and were especially effective against prostate, pancreatic and lung cancers. Next post: How to Get Your Kid to Eat Their Vegetables!